While all eyes were trained for AMD to announced 7nm Ryzen 3rd Generation processors and Vega II graphics cards, the company has surprised us all with its new 2nd Gen Ryzen Mobile CPUs. Whereas in years past AMD would only introduce a handful of CPUs, the chipmaker now has a full product stack to power everything from gaming laptops, Ultrabooks, budget notebooks and even Chromebooks – more on this last one soon. Looking at AMD’s product stack from the bottom up, you’ll find it offers quad-core chips more quickly and regularly than even Intel’s latest Whisky Lake and Amber Lake processor families. The Ryzen 3 3300U is AMD’s second lowest-tier entry-level CPU, but if you were to buy an Intel-powered laptop with the same number of cores you would have to find a machine with at least an Intel Core i5-8265U – or i5-8259U from the Coffee Lake U-series family. 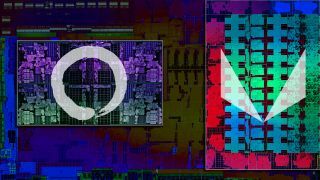 Unfortunately, AMD’s top-tier mobile processor only features four-cores, whereas the Intel Coffee Lake H-series chips have moved up to being hexa-core. However, it’s worth noting that the company has only announced two H-series CPUs, so this could just be the beginnings of the brand’s gaming laptop ambitions. According to AMD, the Ryzen 5 3500U will deliver 14% faster web browsing, 27% greater media editing performance and tie in productivity than an Intel Core i5-8250U (Kaby Lake R). In terms of battery life, Team Red promised users can expect up to 12 hours of general usage and 10 hours of video playback. Of course, AMD’s greatest strength is it integrated, discrete-class Vega graphics and company. The Ryzen 7 3700U pitted against an Intel Core i7-8565U (Whisky Lake) can play most games 10 or more frames per second faster at a 720p resolution and low settings. AMD also plans to keep its mobile chips in top game playing shape by delivering Radeon Software updates to all its Ryzen Mobile processors both past and present. On top of introducing its 2nd Gen Ryzen Mobile Processors, AMD also introduced new A-series chips designed specifically for Chromebooks. In a fight between the AMD A6-9220C and the Intel Pentium N4200, Team Red promises users can expect 23% faster web browsing, 2.5x faster email, 33% faster photo editing and 34% gaming. That last bit seems crucial as Chrome OS and Android seem to be inseparable at this point and gaming on Chromebooks becomes bigger.